Christ comes to Jerusalem – knowing that he will suffer and die – that through his Cross and Resurrection we might be saved from sin and death. Like a firefighter, he approaches the fire to rescue us. He invites us to take his hand, that he might lead us into a freedom of faith and eternal life. Our invitation is to let go of the sins and hurts that have bound us; to unclench our hands from past injuries and allow his saving grace to set us free. This homily was given on March 29, 2015 at the Cathedral of Christ the King in Superior, WI. Below are all the recorded homilies and presentations offered at the Parish Mission for Our Lady of the Valley Catholic Church in Green Valley, AZ from March 7-12, 2015. Special thanks to the wonderful people at OLV for their hospitality – what a joy to be among you! Sunday Homily Podcast – 3rd Sunday of Lent (Year B) – Saturday, March 7, 2015. Monday Homily Podcast – Monday of the 3rd Sunday of Lent (Year I) – March 9, 2015. Holy Week Presentation Podcast #1 – Palm Sunday – March 9, 2015. Tuesday Homily Podcast – Tuesday of the 3rd Sunday of Lent (Year I) – March 10, 2015. 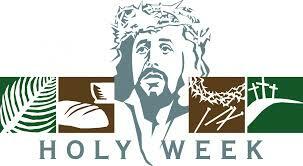 Holy Week Presentation Podcast #2 – Holy Thursday – March 10, 2015. Holy Week Presentation Podcast #3 – Good Friday – March 11, 2015. Thursday Homily Podcast – Thursday of the 3rd Sunday of Lent (Year I) – March 12, 2015. Holy Week Presentation Podcast #4 – Easter – March 12, 2015. In addition, I wish to thank the parishioners at St. Pius X Catholic Church in Solon Springs, WI who welcomed me to preach a concentrated version of this Mission on Saturday, February 28, 2015 – thank you for your kindness…these presentations grew out of our day together! This is the 4th of four presentations given at a Parish Mission on March 9-12, 2015 for Our Lady of the Valley Catholic Church in Green Valley, Arizona. Our STRENGTH comes from the Lord. Through our daily encounter with Christ through prayer and sacrament we our empowered to choose our attitude and seek opportunities to live our faith in the unique and precious moments of each day. Furthermore, the Good News of Christ leads to a SUNRISE of HOPE. We recognize that our personal witness is most authentic when our lives exude the hope and joy that come from Christ’s resurrection. Guided by the Fruits of the Spirit, we can honestly look within our hearts and cast out anything that keeps us from God and one another. This is the 3rd of four presentations given at a Parish Mission on March 9-12, 2015 for Our Lady of the Valley Catholic Church in Green Valley, Arizona. SACRIFICE – giving up something for the sake of something more important – becomes self evident as the Lord offers his life as a perfect offering. Innocent and without sin, he takes our place and helps us to recognize our own sacrifices as a participation in his Cross. SUPPORT appears when we look at two familiar figures in the Stations of the Cross – Simon of Cyrene and Veronica. We read about Simon in the Scriptures, and Veronica has been a part of the tradition of this devotional prayer for centuries; both of them show that even the smallest of actions proclaims the value of human life in our relationships with one another. Running toward suffering and sacrifice, we can (like a Firefighter) be agents in great and small ways for compassion, mercy, and tenderness. This is the 2nd of four presentations given at a Parish Mission on March 9-12, 2015 for Our Lady of the Valley Catholic Church in Green Valley, Arizona. In SERVICE the Lord taught with through his example of washing the disciples’ feet. Found in John 13:1-15, Christ shows his disciples in a clear and direct way that following Jesus demands a call to serve one another. Service is the path that invites us to give our lives, sharing the unique skills, resources, experiences, and talents we have for the good of others. In SACRAMENT the Lord defined the bread and wine as his body and blood. In addition to the Institution of the Eucharist found in Matthew, Mark, and Luke – St. Paul writes of this in 1st Corinthians 11:23-26. Jesus teaches his disciples about his Body & Blood, and then commands his followers to eat and drink. The Sacrament of the Eucharist is a crucial way in which we receive the Lord into our lives – providing us with the strength and grace we need to serve as his disciples. This is the 1st of four presentations given at a Parish Mission on March 9-12, 2015 for Our Lady of the Valley Catholic Church in Green Valley, Arizona.